In the history of cinematography, Bolex movie cameras have made great contributions that led to innovative breakthroughs in motion picture technology. For many decades, the manufacturer set standards in 16mm and 8mm movie cameras. 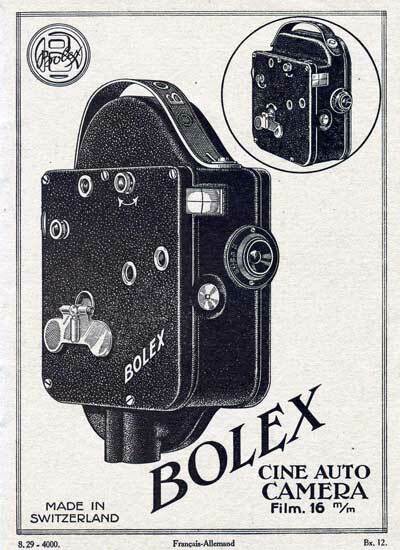 Patents to Bolex film cameras were originally held by Jacques Bogopolsky, but by the year 1930 he sold these patents to Paillard of Switzerland. At that time, Paillard was manufacturing Hermes typewriters and running a distributorship of Thorens gramophones and phonographs. Only five years after buying the Bolex patents, he introduced the Bolex H-16 camera, which quickly became very popular with both professional and serious amateur filmmakers around the worldwide. 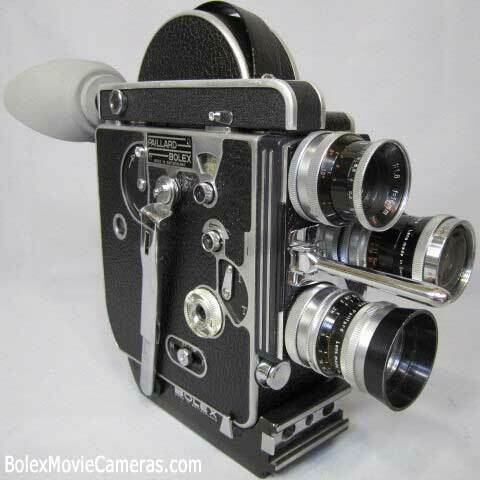 The design of the original Bolex 16mm camera was loosely based on the Bolex Auto Cine B, a model developed back when the patents were still held by Bogopolsky. Aside from the basic design, however, there is very little similarity between the two camera models. The more advanced turret and speed dial added by Paillard are considered as the most significant improvements on the Bolex camera, which saw several other alterations over the following years and sold over 50 different models between 1935 and 1969. No one currently remembers what the "H" in the camera's name originally stood for, but over the years that letter has become synonymous with high quality and versatile motion picture cameras. The unparalleled Swiss craftsmanship continues to ensure that a Bolex film camera can stand even the test of time, as proven by several units that were bought by their owners over 50 years ago and are still in use today. This amazing durability is also one of the main reasons -- aside from the camera's excellent quality -- why it has outsold all other 16mm cameras around the world. There are several different models of Bolex cameras, which can make the choice extremely difficult for an inexperienced buyer. These models, however, are grouped into five general categorizations to help make your choice a bit easier: the H models (reflex and non-reflex) for professional and serious amateurs, the pocket-sized camera ideal for making home movies, the zoom reflex models that are also home movie cameras but with more features added, and the super 8 series. Bolex H-16 EL cameras are now used mostly by film students who consider this the ideal camera based on reliability and accuracy of shots. All major camera functions are controlled electronically, thus allowing one to view, focus and film without having to remove your eye from the viewfinder. It also has a built-in light meter that works very well in preventing over or under-exposure of the film. The Super 16mm Bolex camera is also a popular choice among film students who want to have a camera that works best with large-screen projections. This is a more advanced version of the 16mm, with higher definition that targets modern wide-screen TV technology and is viewed to give a successful blow-up to 35mm standard film. Another type of Bolex camera gaining popularity among film students and other film enthusiasts is the 8mm line, particularly the Bolex P1. This camera is considered by many as having an unmatched collection of features, functionality and quality in either 8mm or super 8mm form. It has a very smooth zoom lens mechanism and may be operated even without the light meter battery. The Bolex camera has proven to be suitable to all types of activity, making it a good choice for use on documentaries, advertising, sports, travelogues, or even wildlife filming. The different models are also tailored to meet an individual's specific requirements, which is what makes it perfect for a film student working on a tight budget. Minimal cost is involved but quality is not sacrificed. If you are an aspiring filmmaker who needs a film camera, there are used vintage 16mm Bolex cameras in mint condition for sale today. These film cameras are available in both 8mm and 16mm film formats. The 8mm is a great filmmaking format for beginners. More seasoned moviemakers who want to do a more complicated indie film will want the 16mm cameras. 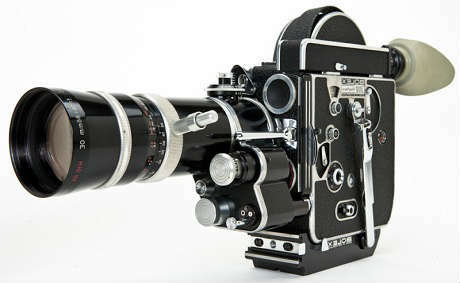 Some filmmakers have even modified their equipment into Super 16mm Bolex cameras. You can also buy Bolex camera parts, lenses, and accessories. Browse through our navigation menu on the left menu panel to find good bargains on these moviemaking cameras. 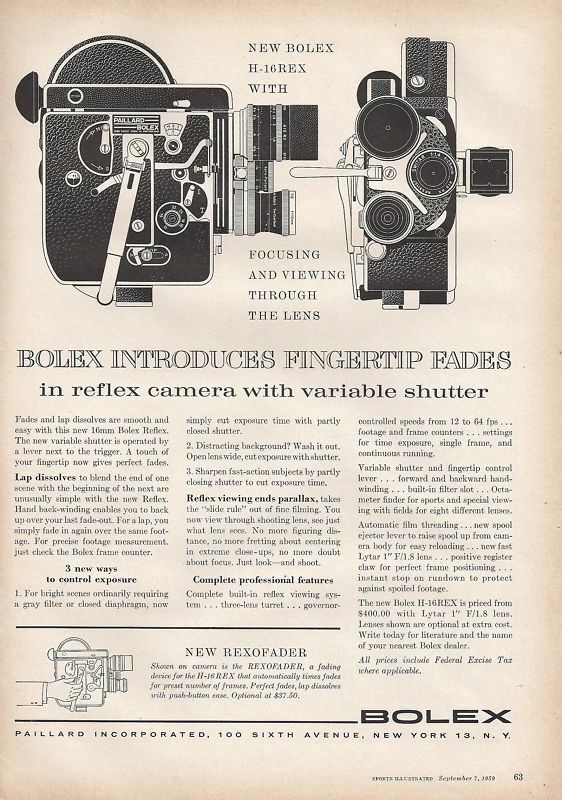 This film camera advertisement is from 1959 and showcases the Bolex H-16 which features "reflex viewing" that ends the problem of parallax and takes the "slide rule" out of fine filming. You now view through the shooting lens to see exactly what the lens exposes onto 16mm film. You do not need to figure distances or fret about centering in extreme close-ups, or have doubts about the focus of the shot. The reflex viewfinders allowed amateur filmmakers during the late '50s to film scenes more accurately with their Bolex 16mm movie cameras. This classic Bolex H16 reflex camera introduces fingertip fades in the reflex camera with variable shutter. Fades and lap dissolves are smooth and easy with this new 16mm Bolex Reflex. The new variable shutter is operated by a lever next to the trigger. A touch of your fingertip now gives perfect fades. Lap dissolves to blend the end of the scene with the beginning of the next are unusually simple with the new Reflex. The hand back winding enables you to back up over your last fade-out. For a lap, you simply fade in again over the same footage. For precise footage measurement, just check the Bolex frame counter. With this motion picture camera, there are three new ways to control exposure: 1. For bright scenes ordinarily requiring a gray filter or closed diaphragm, now simply cut the exposure time with partly closed shutter. 2. Distracting background? Wash it out. Open lens wide, cut exposure with shutter. 3. Sharpen fast-action subjects by partly closing shutter to cut exposure time. These are the top five Film Schools in the United States of America. For more details on admission information, please visit their website or call their office. Est. Tuition: $42,000; Degrees: BA, MA, MFA, and Ph.D.
Est. Tuition: $46,000; Degrees: BFA, BA, MA, MFA, MPS and Ph.D.
Est. Tuition: $13,000; Degrees: BA, MA, MFA, and Ph.D.
Est. Tuition: $38,000; Degrees: BFA and MFA. Disclaimer: BolexMovieCameras.com is no way affiliated with the company Bolex Paillard. This site is only for informational and research purposes only.